Community College Success: Is "follow your passion" bad career advice? Cal Newport says yes. And after reading his new book, So Good They Can't Ignore You, I agree. I have been a long-time believer in choosing your career direction based on something you are interested in. My dad never loved his job and simply stayed to support the family, which I respect immensely. However, he always regretted his lack of options, and consistently told me and my brothers to do everything we could to find work we loved. But to me, that never meant following some deep-seeded passion (in high school my passions consisted of reading, the beach, and Disney movies, not exactly exactly career-worthy pursuits). So while I didn't throw out passion altogether (and if you read Cal's book closely, you'll realize he doesn't throw it out as much as redefine and reorder it), I always intrinsically knew that I needed to work hard and keep options open. That strategy, along with following my interests and skills, led to my current dream job. However - here is the clincher - it is a career I could have never conceived of nor planned in college. So what do you do in college if you want to have a great career but still aren't sure what that is or where you fit? As a generation that has grown up with technology, we can be a pretty impatient lot. And that can extend to the time we think it should take to find a job we like. We see the Mark Zuckerburgs of the world and we assume that success comes quickly. We forget that success takes time. And a closer look often proves that even those who are successful at a young age usually started developing their skills earlier than most. It's that beginning stage, though, that can be the hardest to endure. No one ever tells you in college that most entry-level jobs are unexciting and grueling. However, instead of giving up, getting frustrated, or daydreaming about what you could be doing instead, Cal offers a different approach: to work hard and begin to develop the rare and valuable skills necessary to move up and forward in your career when the opportunities present themselves. 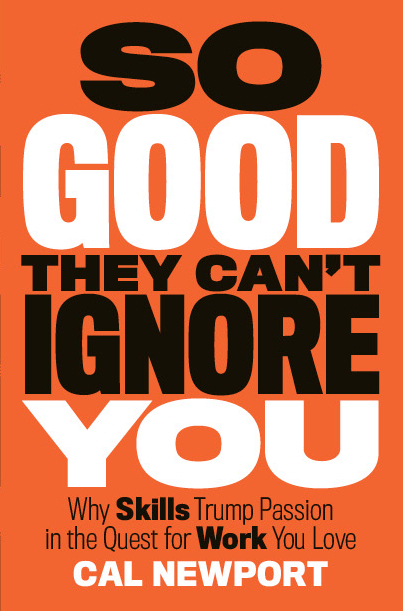 So Good They Can't Ignore You reinforces the idea that success does not occur overnight, nor is your "perfect job" hidden at the end of some elaborate treasure map. Instead, it's something you create. In other words, you don't have to have it all figured out in college or early in your career. But you do have to dedicate yourself to working hard and getting good at whatever it is that interests you enough to apply the kind of diligence that begets greatness. As Cal says in the introduction, "You need to be good at something before you can expect a good job." To figure out what you want to be good at, keep exploring and gravitating towards where you see your interests, skills, and economic need (e.g. what people will pay you for) align. And I highly recommend you read So Good They Can't Ignore You after college or during your junior or senior year. To me, Cal is the Malcolm Gladwell of our generation, and I promise his book will make you think differently about your career and give you the tools you need to craft a job you love, over time. (I also highly recommend Cal's books on college success How to Win at College and How to Become a Straight-A Student).